This is the third edition of Phil Harrington’s popular and comprehensive guide to astronomical equipment, written for both new astronomers as well as experienced amateurs. It includes numerous tips and tricks from other experienced astronomers. Now more than ever, the backyard astronomer has a dazzling array of choices when it comes to telescope shopping – which can make choosing just the right sky-watching equipment a formidable challenge. 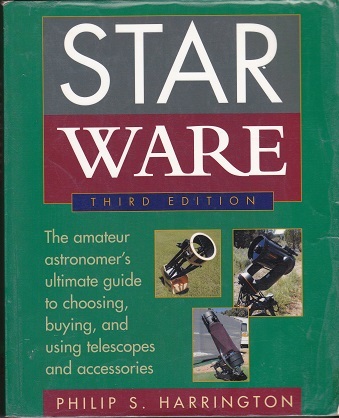 In the revised and updated edition of Star Ware, the essential guide to buying astronomical equipment, award winning astronomy writer, Philip Harrington does the work for you, analyzing and exploring today’s astronomy market and offering point-by-point comparisons of everything you need. Whether you’re an experienced amateur astronomer or just getting started, Start Ware will prepare you to explore the farthest reaches of space. Extensive expanded reviews of leading models and accessories, including dozens of new products, to help you buy smart. A clear, step-by-step guide to all aspects of purchasing everything from telescopes and binoculars to filters, mounts, lenses, cameras, etc. Eleven new do-it-yourself projects for making unique astronomical equipment at home. Easy tips on maintenance, photography and star-mapping to help you get the most out of your telescope. Lists of where to find everything astronomical, including internet sites and Web resources.